Here I am in Bulgaria, a country not widely known about. However it is joining the European Union in 2007 so it may be in for something of a transformation of the kind that has been experienced by Latvia and Lithuania. I have been to Sofia on a number of occasions over the years. This is the first time since 2001 when I last did the Neue Stimmen auditions here. However, we had especially good relations with the Bulgarian opera world at Glyndebourne where a wonderful man, Michael Hadji Mischev, did a couple of splendid productions in the late 1960s - most notably Eugene Onegin with Elisabeth Soderstrom as Tatiana in 1968. This is a production with a Chicago connection in that Andrew Davis conducted it in 1975 - and the title role was taken that year by Richard Stilwell who is still active as a singer but is also an important member of the CCPA Voice Faculty at Roosevelt University. So I have been here on the search for singers half a dozen times. Bulgaria has produced a remarkable number, for such a small country, of distinguished singers. Notable are the basses Boris Christoff and Nikolai Ghiaurov, and the remarkable dramatic soprano Ghena Dimitrova who died earlier this month. So I am hoping that a new generation of stars will turn out for my auditions tomorrow. I will keep you posted. This was a strong day with lots of excellent singers but somehow nothing overwhelming. But we should have some good candidates for the finals. It was a treat today to have Francisco Araiza with me as a juror. He lives in Munich now and teaches in Stuttgart, and remains a member of the Zurich Opera where I first heard him so long ago. He was in great form and tremendously valuable, as only singers can be, in addressing some of the technical issues that come to the fore in competitions like this. Lunch was fun as always – that cafe in the Lembach House museum is a must for anyone doing a trip around this museum district. Here are our two pianists, Celine Dutilly and Peter Nelson (sitting) with Ines Koring, who is the General Manager of the Neue Stimmen project for the Bertelsmann Foundation, and Francisco Araiza. We had a particularly excellent Saffron Tagliatelle with Salmon in addition to the usual antipaste which we have enjoyed all week. Off to Sofia in the morning – so early and quick supper, then re-packing for the umpteenth time this trip. A special message for COT audience, past, present and future - subscribe now! Time is running out for getting the deal of the year - 2006 tickets at 2005 prices. I sat there sweltering all day – it must have been 90 in that room. But at least we were getting some results. The level is altogether higher, and by lunchtime we had one for the wait list and a finalist as well – and not a single dud singer. The afternoon yielded another finalist and wait lister so I consider that better than par. There were however a few duds! Our auditions here, as last time, are in the Carl Orff auditorium of the Musik Hochschule, in Luisenstrasse, a delightful 10 minute walk from my hotel. This is in a part of town rich with museums. 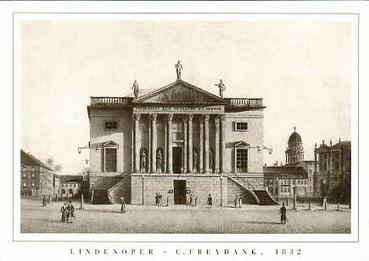 Just a stone throw away are the Pinakotheks – Neue, Alte, Moderne, and the Glyptothek. Also the Staatliche Antikensammlungen and, most delightful of all, the Lenbach House. It is to here that we repair to lunch, just 75 yards from the Carl Orff auditorium – an Italianate Villa with an Italian garden, a splendid cafe (not normally open on Monday but opened today especially for us), and 70 Kandinskys as well as numerous Klees and other good things. It is now very late……….. Yesterday morning’s recital was the joy of the day – Barenboim playing to a full house at the Staatsoper, a perfect space for this in both size and shape. All Berlin turned out as no doubt they will have for each of the eight recitals in this Beethoven Sonata cycle. We were treated to two hours of eavesdropping on this remarkable musician’s further exploration of these works which have been central to his life. He finished with a storming performance of the Appassionata, and the applause seemed likely to continue long after I left to go to my auditions in the adjacent building. Berlin is a city apart with both Barenboim and Simon Rattle. Chicago will miss him terribly after 2006. We finished up the auditions in Berlin with just two finalists, a pretty poor haul from 200 candidates. I feel confident (why?) that we will do better in Munich where I now am after the little 45 minute flight yesterday. Staying at the brand new Sofitel, equipped with all the latest gadgets which present something of an intelligence test to get them to work. I just managed to turn on the taps in the bathroom............but it is very comfortable and not expensive. We begin at 11 this morning and will continue to 7pm. So no let up at all. It appears that we will be in the 80s all week – mild compared to Chicago I gather. Did they really experience 99 degrees last week? That’s not good in June. Well quite a lot actually although I am not sure that this is the place to say all of it! We had another frustrating day yesterday, hot, more crash bang from the orchestra next door, no Dvorak, and – more to the point – a poor turn out at the auditions. Poor, not in quantity – there were masses – but poor in quality. Inevitably, if my target in to select one in twenty on average, there will be candidates that don’t quite make it but get pretty close. However there was little contest here; there was really no decision making to be done. It was easy – just no, no, no! We award a possible five points on each of four attributes, vocal quality, technique, artistic personality and musicianship. Finalists will score 15 or over, wait list 13–14, and a reasonably competent professional will be in the range 9–12 losing points mainly on the arguably more subjective judgment of vocal quality and artistic impression/personality. A score of more than 16 is extremely rare and indeed I have just one so far. All the other finalists are fifteens or sixteens. However I will be putting forward tomorrow some super singers from the “wait list” and any one of them could easily emerge a prize winner in October. Their slightly lower scores at this stage reflect nothing more than the performance of the day and perhaps my mood and attitude at that particular moment. That can work both ways – both in favor and the other thing. So the “wait list” is very important and it is clear that a good many will be moving off it this week. Anyway yesterday one singer achieved a historic zero in all categories. Of course over the two days to date there have been some in the 9–12 category, and also a couple of 13–14. But there were far too many under eights, not just under but miles under. But thanks to the splendid company of Ute Trekel-Burkhardt we have been able to have some fun and a nice interlude when the delightful Pavol Breslik popped in to see us. Pavol sang Tamino in Glyndebourne last year and became a favorite of everyone for his relaxed and smiling approach to life. We spent a happy evening with him at mutual friends in London last summer and it was very nice of him to bring some lightness to our day. He is a member of the Staatsoper company so Ute has sung with him often of course. Ute is the perfect judge for me since she is much more expert than me in at least one crucial respect. She brings a sound technical analysis to the discussion of each singer (when discussion is needed!). Overall we share the same values and thus come, generally speaking, to complete agreement very quickly. And our lunch breaks have been fun too – spent on both days at this restaurant 50 yards from the theater. We have another session this afternoon before leaving for Munich on a late flight. But there is a supreme treat this morning. Daniel Barenboim is in the middle of one of his eight recital Beethoven Sonata marathons at the Staatsoper and fortunately I will be able to catch the fourth of them at 11am. He will play no less than five sonatas today – Op 10/1, Op 22. Op 49/1 and 2 and Op 57 – the Appassionata. It will be sad to leave this great city and I am sorry that I have been unable to see much of it this time. It is not the place it was when I came here first in 1966. The reconstruction and general repair of Mitte proceeds magnificently. Unter de Linden remains under major construction but I guess that by the time am back here in 2007 its majestic and monumental Prussian grandeur will be fully restored. And Friedrichstrasse is now a major shopping street of course! I managed to get this picture of the Staatsoper without any building works around it. There is much of course – so this is not the best angle of view. I arrived in Berlin on Thursday evening – and I have been zooming, with increasing sluggishness, since. I had nice dinner with my Bertelsmann colleagues on Thursday evening at a popular restaurant on the banks of the Spree by the Berliner Ensemble, 50 yards from Bertold Brecht Platz. Yesterday, Friday was a very long day. Our auditions here are at the Berlin Staatsoper (of which Daniel Barenboim is Music Director). We were in a rehearsal room within excellent, but in this case disadvantageous, earshot of the orchestra rehearsal room where Christoph Eschenbach was rehearsing crash bang Prokofiev 5. With the temperature in the 80s we just closed the windows and put up with it. Since the concert program on June 28 also includes the Dvorak Cello concerto maybe we will have that today…….. I have on the jury with me here Ute Trekel-Burkhardt, one of the former East Germany’s greatest singers. She joined the Staatsoper in 1973 and remains a distinguished member. She appeared on the Stage there earlier this season as the Countess in the Queen of Spades, with her son Roman Trekel in the role of Yeletsky, Domingo as Hermann and Barenboim in the pit. We sweated it out until 7pm, and then went straight to a performance of L’elisir d’amore at the Staatsoper with one of the Neue Stimmen winners of 2001, Anna Samuil, as Adina. Ramon Vargas was a delicious sounding Nemorino and the production was one of those German productions. And not a lot of rehearsal by the look of it for this repertory revival. But Anna, who has a two year contract as a member of this company, did a fine job and overall musically, as one would expect in Barenboim’s house, the performance maintained an elevated standard. The picture above was taken at dusk – that is the Brandenburg Gate in the distance – as I walked back along Unter den Linden to Friedrichstrasse where I am staying at the Maritim Pro Arte, together with a huge number of beach volleyball players. The Swatch World Championship tournament is here this week, as it was when we were here in 2003. Today, Saturday, we have more of the same - auditions that is, not volleyball. I was wonderfully looked after in Warsaw by Krzysztof Kur who has been involved with the Warsaw Chamber Opera for years both as a singer and administrator. The devotion of this organization to Mozart, driven of course by the passion of its General and Artistic Director Stefan Sutkowski, has brought about the Mozart Festival, a unique event. Krzysztof has organized the Warsaw auditions for the Bertelsmann Stiftung since 1997, and does a great job. His contacts in Polish opera circles is unrivaled and his combination of enthusiasm and efficiency is irresistible. I spent the morning packing up to go to Berlin and then took a short walk around the old town which is bustling with life with the usual combination of cafes, restaurants and small shops - and of course people! The old town has been lovingly restored and is now a UNESCO heritage site. Krzysztof then met me at the hotel and took me to lunch for a Polish treat - Pierogis. They are a delicious and inexpensive variety of Ravioli. Try them - they must be available in the world's second Polish city - Chicago. Otherwise click the link and make them yourself! He then took me to the airport, where I now am, for my flight to Berlin. 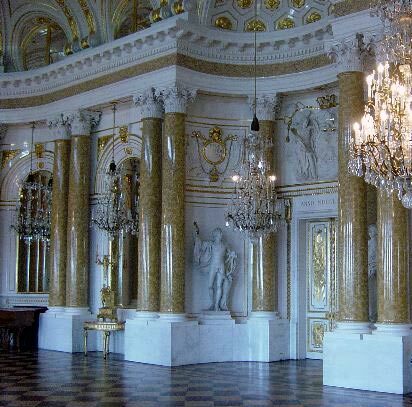 This was a marvelous 75 minutes of music making in the Ballroom of the Royal Palace (seen below). Two Mozart Piano concertos K246 and 451, and the Haffner Symphony. The pianist was Viviana Sofronitzki playing a fortepiano modelled on a surviving Anton Walter instrument from 1795. Walter built Mozart's pianos - the Steinway of the late 18th century I suppose! This instrument was built by an American living in the Czech republic who is one of the most respected fortepiano builders working today - Paul McNulty. Follow the links and you will find all you need to know! And after the concert a quick delicious dinner at the Bazyliszek restaurant, in Old Town Square. I am slightly losing track of time. Anyway today I have had my Warsaw auditions and we have just one finalist. I had three eminent singers on the jury with me. In addition to Jadwiga Rappe whom I mentioned yesterday, we had Hanna Lisowska and Kazimierz Pustelak. Here we are at lunch today! Hanna Lisowska spent 63 days under siege with her parents during the Warsaw Uprising in 1944 just 300 yards from this restaurant by the theater. She tells me that Norman Davies's Rising '44: The Battle for Warsaw is an outstanding account of those terrible events. For those into the history of Europe in the 20th century this is apparently the best record - well that is the opinion of someone who lived through it. This evening I am going to a concert - enough singers for the day. This is part of the extraordinary Mozart Festival organised by the Warsaw Chamber Opera. Each year they manage to put on EVERY opera Mozart wrote. And now they are on to the piano concertos - more about that later.